Following Syriza’s Greek election triumph, left-wing campaigners from Britain’s Trade Unionist and Socialist Coalition (TUSC) held a celebration and solidarity demonstration at the Greek embassy in London. They assembled at the embassy on Monday night to both celebrate Syriza’s victory and to advocate anti-austerity measures in the UK. “If they can vote against austerity there, we must provide an anti-austerity choice here,” the group said. The demonstration, however, came as international investment firms express concern at the economic repercussions of Syriza’s accent. TUSC aims to field 1,000 candidates in local elections and stand a further 100 for seats in Westminster in the 2015 general election. It claims that its election challenge will represent the biggest socialist challenge in Britain since 1945. TUSC features a number of former Labour Party councilors who were suspended for their opposition to austerity measures, which are broadly accepted by the Labour leadership as necessary. Dave Nellist, former socialist Labour MP for Coventry South East from 1983 to 1992, was expelled from Labour at a time when the party’s stance was shifting to the right. Nellist, who is set to attend the demonstration, said events in Greece should inspire similar movements across Europe. 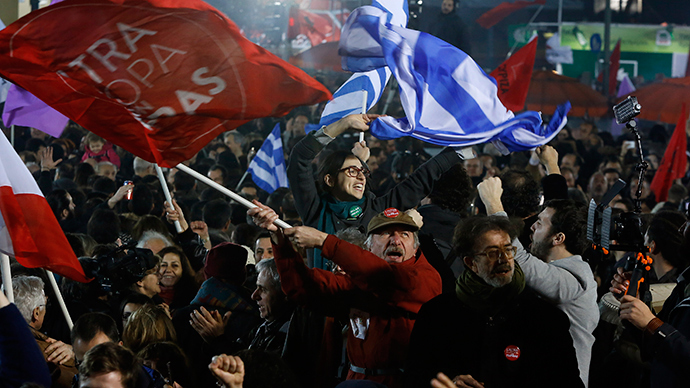 “The win for the anti-austerity party Syriza in today's Greek elections will reverberate around Europe,” he said. “Millions of workers in other countries also suffering cuts in living standards and rising unemployment – whilst facing a rich elite which has successfully protected itself from recession – will ask ‘if they can do it in Greece, why can't we do it here?’” Nellist added. He said the public should be inspired by the actions of the Greeks during the next election. Their optimism, however, is tempered by warnings issued to investors earlier on Monday by one of the world’s largest independent financial advisory organizations. The DeVere group warned the election could prompt “Greek-led volatility” for six months. He predicts a weakening euro and expects investors to move to economic “safe havens.” He also envisioned the growth of “populist” parties in Europe. Elliott likened new Greek Prime Minister Alexis Tspiras to Lula da Silva, the left-wing Brazilian President who is credited with modernizing the country. “It is early days and the story is just beginning. However, history teaches us that what is happening in Greece politically will have far-reaching effects on the capital markets and will impact investor returns,” he said. Tspiras was sworn in as prime minister on Monday, attracting mass global attention after the historic election.